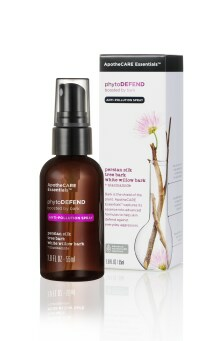 PhytoDefend face spray, boosted by bark and niacinamide, helps skin defend against fatigue from artificial blue light and pollution. The Persian Silk Tree Bark, used at active levels, energizes skin to visibly reduce the signs of skin fatigue. Shake well. Gently mist face with eyes closed. Use throughout the day for a refreshing sensation. Use 1 to 2 pumps. A luminous, deeply refreshing face spray that can be applied over make-up. Use after applying your moisturizer. Bark is the shield of the plant. 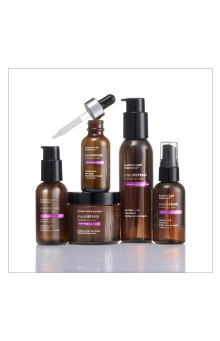 ApotheCARE EssentialsTM captures its essence into advanced formulas to help skin defend against everyday aggressors. 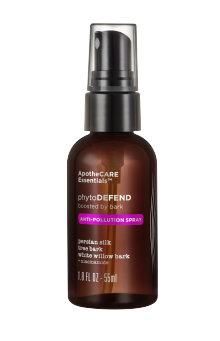 PhytoDefend Anti-Pollution Spray is rated 4.2 out of 5 by 62. Rated 5 out of 5 by cookie859 from Great product I got this product free of charge gratis from Influenster to review but my opinions are all my own! I love this spray. It smells so good (I like scent in skincare) & hydrates my face. 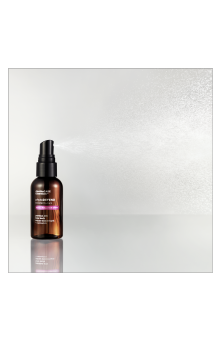 It makes a good setting spray & refresher through out the day. I’d buy this & I would buy this to replace it. It’s very nice. I like it! I’m glad I had an opportunity to try this brand. I had never heard of them before. You should try it if you have oily skin & want to purify your skin as well as aging concerns. You can use this against blue screen pollution I know that’s a big consideration for me since I spend a lot of time in front of a screen. Thanks for reading! Rated 3 out of 5 by Jovanka from Not for me I am not sure I understand this type of product. It’s refreshing, sure but I don’t see any reason to encorporate it to my routine. It’s unneccessary and not particularly beneficial. Or I can’t tell if it is, I honestly didn’t see the difference. I don’t mind the smell but spritzing throughout the day might interfere with perfume you are wearing. I stick to using this only at home as some spray-tonique kind of thing. To summarise I can’t recommend or not recommend this product really. There’s nothing wrong with it and surely some people will find everything they want in phytoDEFEND spray but I think I’ll be all right without it. Rated 3 out of 5 by Makeupfunnn from Worth trying I did enjoy this spray. Are use it at night after toner before my serum and I do think my skin felt a little fresher. I don’t think it did anything extra aside from what my normal routine usually does. I did like this spray as a midday make up refresher. It made my make up in my face feel refreshed. The reason for three stars is because it is a nice setting spray I don’t think it does what he claims to do. I also don’t like that there is added fragrance. A lot of other ingredients are good for you and clean I don’t know why company still at fragrance. If you need a good mid day make up refresher this is worth a try. Rated 4 out of 5 by Aflockofmoose from Non-sticky Defense Spray I am not generally a fan of facial sprays because I have not had the best of luck with them. They often feel like they are sitting on my skin rather than being absorbed. They have often felt sticky rather than refreshing. PhytoDefend Anti-Pollution Spray is neither. It is a fine mist that quickly absorbs into my skin leaving it feeling fresh and renewed. It does not leave a residue afterwards and makes my skin feel silky and soft. The scent was a little troubling for me as I am sensitive to perfumes, but it is a flowery powdery mix just like the cleanser and serum. I received this item complimentary as part of a campaign through Influenster. Yes I would recommend this product to a friend. Rated 2 out of 5 by Hmb123 from Strong fragrance I received this product to test through Influenster for my honest review. I have only been using this mist for a short period of time but I have an opinion based off the short term effects. The first thing I noticed was the very strong fragrance/perfume, it doesn’t smell like skincare and it is not a subtle smell, it actually smells like a strong baby powder in my opinion and it’s really off putting to me. However, the mist is very fine and even which is nice. I haven’t noticed it being super hydrating or nourishing, it feels more like I’m spraying a body spray on my face not skincare. Rated 4 out of 5 by curlyp from A nice, refreshing little pick-me-up I received this along with the face wash and serum, also from the phytoDEFEND line from Influenster in exchange for my HONEST opinion. Initially I did not think I'd really use the spray, but after falling in love with the other two products I've found ways to work it into my routine. Whether it be after blow drying my hair, and wanting to give my face a little love, giving it a couple of spritzes before the serum if I've forgotten to put it on right after cleansing, or after I've done my makeup. I could also see the spray coming in handy for use after a quick workout. Rated 4 out of 5 by ATovar from Love I received this complimentary spray in my Influenster VOXBOX to test out and review. I love how this product doesn't have any harsh chemicals or dyes. Let's get real, your not only spraying it on your face, but you also inhale some of the product as well. No one wants harsh products in their lungs! Anyone could use this as a fresh pick me up when needed. If your stuck in the office, under blue lights all day, i highly recommend.The smell is amazing. The mist is just right, some products I mist make me feel like soaking wet, or have to wait for a while to dry, this product does not! The smell is Devine. I have combination skin and it doesn't break me out or make my skin burn or turn red. The size could fit right in your purse. Rated 5 out of 5 by Mommytomakeup from My new favorite Wow this spray is awsome! I received this product for review from influenster. My opinion is my own. The whole phyto defend line is awsome, the spray is my new favorite. I really enjoy mists in my skincare routine and this one was great. It smells just like the rest of the line a little floral and really hydrating. I have been using these products for 3 weeks and my skin looks amazing for the harsh winter weather here in Kentucky. I use this spray 3 to 4 time's a day and it hydrates my skin really well. I love the way my skin looks and feels after I use it. My only complaint is I wish it was bigger. I will be buying all these products when my run out. Thanks so much influenster and apothcare essentials for letting me test your products.